Having been in our consciousness for so long now, zombies have stopped scaring us. These single-minded, hulking undead creatures – their very flesh rotting so badly that it keeps falling off – are now best presented as either a nostalgia retread (Dawn of the Dead) or plain-out satire (Shaun of the Dead). It’s hard to make a serious-minded zombie piece any more – regardless of the medium. Which is precisely why Robert Kirkman’s The Walking Dead (Image Comics, 2003) was such a standout. In that graphic novel, Kirkman imagined a world where zombies overwhelmingly outnumber humans. A small set of characters stick together and in the face of overwhelming odds try to escape the backwaters and make their way to Atlanta in order to survive. Laced with the basics of a great soap opera and couched in a vibe of post-apocalyptic dread, The Walking Dead was a high-profile success for its creators and ostensibly the reason Kirkman was invited to write a romp involving zombies and the beloved characters from the Marvel Comics Universe. 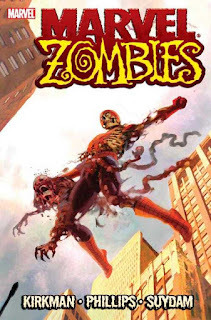 Marvel Zombies is a story set in a parallel universe, which is really an excuse for writers to indulge in some creative storytelling without regard to legacies, both emotional and financial. It’s a perfect landscape for bloodletting, a fact which Kirkman exploits to his advantage. Kirkman also wisely eschews trying to repeat his previous success with a serious storyline. He injects life into Marvel Zombies primarily by infusing it with so much irreverent gore that all of it becomes funny. In the story, an unidentified carrier has spread an infection that converts everyone into a zombie. Most of the Marvel superheroes and villains are now zombies. There are no humans in sight, most probably devoured by the zombies. Unlike most undead you see in popular literature, these Marvel zombies have a range of emotions and can talk… a lot. They get depressed, bicker, fight among themselves, threaten each other, trash talk their opponents and make detailed medium-range plans. All of this centers around their next meal – which consists of anything living they can find. In the startling opening sequence of the novel, Magneto, a survivor of the plague is chased by a number of Marvel Zombies, including Captain America, Spider-man, Hulk, Hawkeye, Giant Man, Thor and Wolverine. Powerful as he is, the master of magnetism finally succumbs to a bite on his neck from the Wasp. And as he goes down, the former superheroes descend on his body in a feeding frenzy. “I hope you choke on me,” cries Magneto the last time you see him. Illustrator Sean Phillips renders the zombies with limp and unfinished lines, displaying them as decaying and physically unraveling. His zombies have glazed white eyes and sharp knitted fangs, their mouths perennially caked with blood. The scenes of carnage are depicted in panels soaked in red and black. It’s roundly gross and full of pulpy humor. During a fierce battle with a potential meal, Iron Man is ripped into half and requests a fellow zombie to throw his torso back in the fray so he can grab a bite. Spider-man agonizes over how he had to consume his wife and aunt to curb his cravings. He also gets his leg ripped and has to ask Luke Cage to carry him around. Captain America has his own shield thrown at him and gets top of his head neatly sliced. In a later battle, his exposed gray matter is exploited by his archenemy Red Skull. Kirkman particularly has savage fun with Bruce Banner. Banner transforms himself into the Hulk whenever he is angry, which here happens whenever he is hungry. This is pretty much all of the time. But after the Hulk has fed, the anger settles and Banner returns. This presents a problem, because the large portions eaten by Hulk no longer fit into Banner’s stomach. The stomach bursts open. And then things get really gruesome. Kirkman finds new ways of tearing down mighty superhumans, showing us how they've lost all sense of heroism and indeed humanity itself. It's a recurring theme in a lot of literature: the best can turn evil in the worst of circumstances.